Appetite is both a mental and a physical phenomenon. Your body knows when you are hungry and when you are full, but sometimes, you might want to eat when you are not hungry. You might even want to continue to eat after you are full. A few changes to your diet might help you to control your appetite and make you feel fuller for longer. Coffee - Coffee is a natural appetite suppressant as well as a mild diuretic. Hot or cold coffee is a great way to curb your appetite in the morning or afternoon. Proteins - Protein is a slow digesting food which keeps you going for a longer period of time. 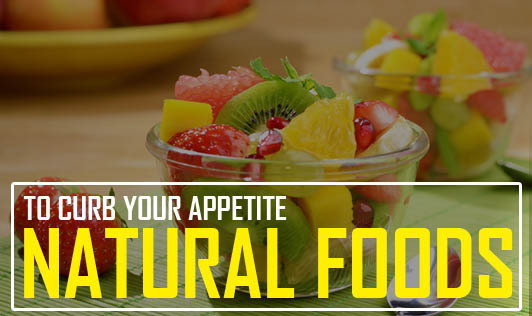 It helps to reduce your appetite and decrease your food craving thereby making you eat less. Salads - Fiber keeps you satiated for longer and kills your cravings. It helps to slow the entrance of glucose into the bloodstream, making you less likely to be hungry. Get fiber by including fruits, vegetables, greens, sprouts, whole grains and nuts in your salads. Soup - Soup is one of the best kept secrets for appetite control and weight loss. The secret is soup's combination of high water content and low calories. Make sure to choose broths or vegetable soups and not their creamy-rich cousins. Flaxseeds - Flaxseed is the best known plant source of omega-3 fats, and 30 g provides 8 g of fiber that helps control appetite. The more fiber you eat at any meal or snack, the slower the rise in your blood sugar, helping to keep the hunger hormones at bay. Water - Water is a fabulous natural appetite suppressant. Drinking water at regular intervals throughout the day will help to keep your appetite in check. Besides these foods, you can also try exercising to curb your appetite. People think that exercising increases hunger pangs, but it not only helps you burn calories, it also helps you consume less of them. Both aerobics and weight-training alter your body's hormone levels in a way that temporarily suppresses appetite by releasing natural endorphins.